Salon Privé has confirmed its world-leading line-up of cars in the event’s inaugural Pirelli Prestige and Performance, paying homage to super & hyper cars from 1975 to the present. 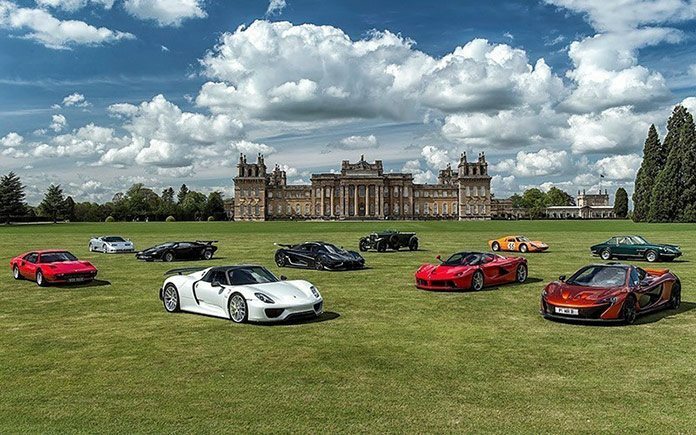 Presented in The Great Court and paraded through Blenheim Palace’s beautiful grounds, the innovative new competition is the centrepiece of The Salon Privé Supercar Show, the event’s first ever public day, on Saturday 5th September. In the Pre-Millennium Supercar category is a Bugatti EB110 SS. A hugely significant car, it was the prototype for the subsequent lightweight Super Sports version. Used extensively for bodywork development, this 1993 model received the experimental interconnected fuel tanks later used in the production of the US Super Sport version. This engine number, ‘026’ was also used for land speed and performance testing. Also in this class is the Lamborghini Diablo GT. Replacing the legendary Countach, the Diablo was the fastest, most advanced and most expensive Lamborghini ever built. Introduced in 1999, only 80 of the Diablo GTs were made, boasting an enlarged 6.0-litre engine that produced 575bhp. Car enthusiasts will be able to feast their eyes on a rare Maserati MC12 Stradale which is in the aptly named “Blink and It’s Gone” class. Developed to signal Maserati’s return to racing after 37 years, the road version was produced to homologate the race version. This model is one of only 50 ever produced. Unsurprisingly in the same category, is the only Lamborghini Reventon Roadster in the UK. This all carbon-fibre Lamborghini was designed based on an F15 fighter jet. Only 15 models were made, however, this particular model is even rarer, as it’s one of only three right-hand-drive examples. Jay Kay’s infamous green LaFerrari is also in this class. Well-known for his impressive car collection, Jay proudly enters his LaFerrari, one of the marque’s most ambitious projects yet. Pushing the boundaries of technology on a road car, it showcases Ferrari’s technical capabilities in both GT and Formula 1 engineering. In the sophisticated “Grace and Pace” class, is a 2009 Alfa Romeo 8C Competizione Coupe. It is number 422 of 500 manufactured worldwide, produced in the unique colour Blu Oltremare as a special factory order. With a carbon-fibre body and a 4.7-litre 450bhp V8 engine, only 40 cars were originally allocated to the UK. Every car enthusiast will know of the Bugatti Veyron, and the Grand Sport Vitesse is a very special edition. As part of a class celebrating “Ten years of Veyron Production”, this model combines the engine of the Super Sport with the space and comfort of the original Grand Sport. The Grand Sport Vitesse is the fastest production roadster in history. One of the newest cars in the competition is a 2015 Ferrari 458 Speciale Tailor-Made. Competing in “Built for Speed”, this model was built to the owner’s specification as part of an exclusive new personalisation programme from Maranello. This 458 Speciale takes its inspiration from Ferrari’s sporting history, offering a brace of racing-derived materials, finishes and liveries. Entrance tickets into the ‘Pirelli Prestige & Performance’ Competition cost £20 and also include access to the stunning grounds of Blenheim Palace. For those wishing to have the full Salon Privé experience, a limited number of VIP Hospitality tickets costing £114 are still available. These tickets includes luncheon and refreshments as well as full access to the fabulous Concours entries, stunning Super, Hyper and Concept cars and an amazing range of high-end luxury brands and products. 81⁄2 Otto e Mezzo Bombana – 3 Michelin Stars, what else?